What's the used Volvo XC40 estate like? It might have amassed itself a reputation for safety, but style is not a concept that’s been very often associated with Volvo’s cars. True, there have been a number of desirable and wonderfully designed Volvos in the past, models such as the P1800, 480 ES and C30 Coupé, but for the most part 'fit for purpose' perhaps better describes the cars that have coloured the marque’s history throughout the years. However, more recently, Volvo has been on a bit of a roll, with a host of good-looking models that, in some cases, border on the striking; think of its large executive cars, the S90 and V90. Its handsome and popular large SUVs, the XC60 and XC90, were joined in 2017 by this smaller, more compact SUV, the XC40 – a car that oozes style both inside and out. But don’t think that it doesn’t cut it underneath its fruity bodywork, because we were so impressed by what it can do on the road and how good an ownership proposition it is that we crowned it our overall Lombardyexperience? Car of the Year soon after it was launched. And it seems to cater for all wants in this class. Under the bonnet is a range of four-cylinder engines that will be familiar to modern Volvo drivers. Petrols on offer comprise a 154bhp 1.5-litre T3 and two versions of the 2.0-litre engine, the 187bhp T4 and the 244bhp T5. There are also two 2.0-litre diesels, the D3 and D4. Trims start off with entry-level Momentum. This comes with lots of goodies, including cruise control, keyless start, dual-zone climate control, a 9.0in tablet touchscreen, digital instruments, 18in alloy wheels, LED headlights and rear parking sensors. Next up is the sportier R-Design. This adds seats trimmed in leather and nubuck, power-folding door mirrors, privacy glass and multicolour ambient theatre lighting. The more luxurious Inscription model completes the range and adds metallic paint, an electrically adjustable driver’s seat, front parking sensors, a powered tailgate, wood trim inlays and a crystal gearlever on automatic versions . Trims with 'Pro' at the end of the name add adaptive LED headlights, heated front seats, an electrically adjustable passenger seat with memory function, headlight washers, a heated windscreen and 19in alloy wheels. Options worth seeking out include the Convenience Pack for its extra practicality. 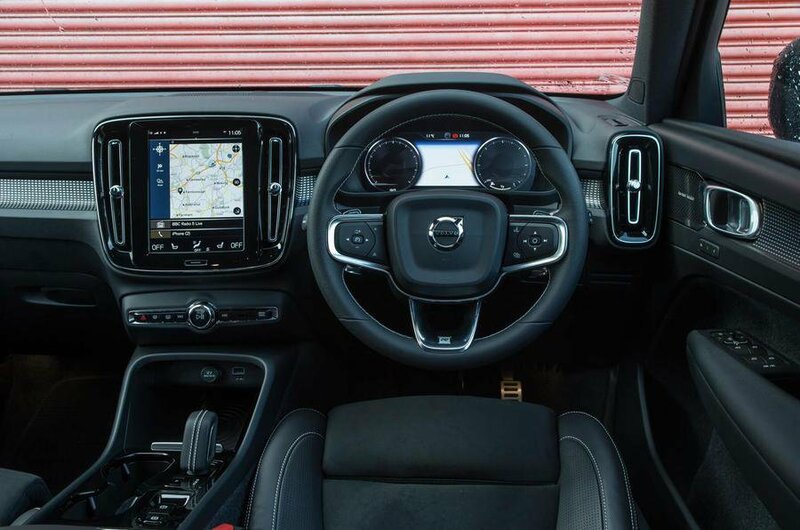 On the road, the XC40 is a smooth and hushed performer, with a low level of wind and road noise, helping to make the interior a noticeably refined place in which to spend time. The T3 petrol needs to be revved rather hard, and with it the XC40 isn’t the quickest thing, so we’d suggest stepping up to T4 or the D3 diesel to fully appreciate the car’s virtues. Better still would be the T5 and D4, both of which have more than enough oomph. Indeed, the D4 is quite a flyer, and its flexible engine gives the car a refined and relaxing air that suits its undoubted suavity. 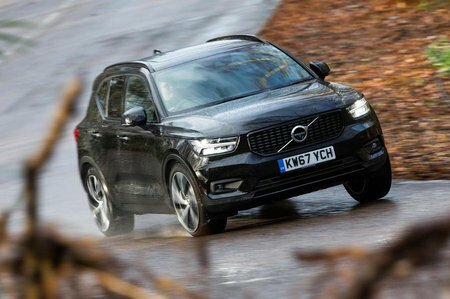 Fling it through a series of bends and the XC40 reveals itself as competent, if not inspiring. It leans a fair bit at speed and the steering, while reasonably quick, is a little imprecise, but there’s plenty of grip. The car rides well, being composed and breezes over road ripples easily, although oddly it’s rather better on ‘sports’ suspension than the softer ‘dynamic’ suspension. Our experience of the car on the optional adaptive suspension so far suggests it’s not worth seeking a car out with this fitted. Inside is an excellent driving position, with good visibility, a comfortable seat and plenty of adjustment. Digital instruments are standard and prove easy to read at a glance, and because the minimalist dashboard design carries few physical buttons, it’s easy to interpret those that are there. However, you do have to access quite a lot of functions through the 9.0in tablet-style infotainment touchscreen; this can actually prove to be a faff, but at least the screen is crystal-clear. When it comes to interior quality, the XC40 is exceptionally classy. All the surfaces that you interact with regularly feel suitably upmarket, thanks to h, soft-faced materials, smart wood veneer or metal highlights. And everything feels robust, too, so should stand the test of time and the demands of family use. There’s plenty of space up front, while rear passengers have enough leg and head room, although rivals such as the BMW X1 and Volkswagen Tiguan offer slightly more. On paper, the XC40’s boot is smaller than those rivals, too, but in everyday use it’s wide, deep and easily accessible, with a useful underfloor storage area.